For those who have experienced it, it's true that your wedding day goes by in a blink. The best part of having the day fly by is that it means that you are closer and closer to your honeymoon. POPSUGAR Insights recently surveyed over 1,200 married or engaged POPSUGAR readers to learn how they spent their honeymoon and how much they spend on their trip. Overall, 82% of women have gone on or plan to soon go on their honeymoon. One-quarter of women selected US destinations for their trip, while 8% selected Caribbean of Mexican destinations. 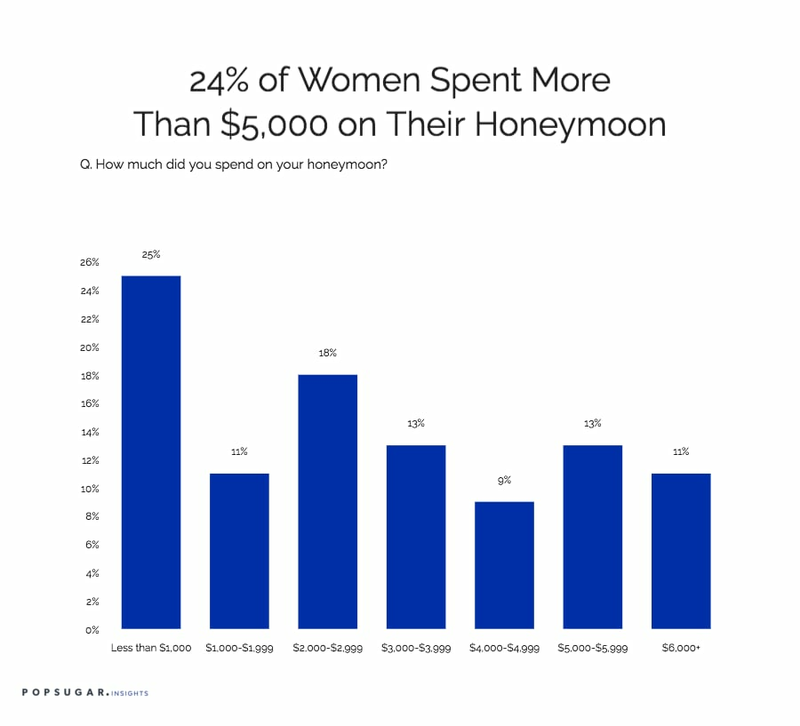 In terms of the amount that women spent or plan to spend on their honeymoon, 42% of women spent between $1,000 and $3,999 on their honeymoon, with 25% of women indicating they spent less than $1,000 in total on their trip. Eighteen percent of women spent between $2,000 and $2,999 on their honeymoon and 24% spent over $5,000 on their honeymoon. Looking back with perspective on their wedding day, women indicated that their favorite memories included a variation on "walking down the aisle," while their most stressful moment was "getting ready before the event." Happily, 95% of women we surveyed said that they are still married to their first spouse, and 79% of women would consider renewing their vows at some point in the future.